What Can You Do with 3GB of Data From Straight Talk Wireless? This is a sponsored post written by me on behalf of Straight Talk Wireless. All opinions are 100% mine. I’m going to tell you something: data plans intimidate me. I just got my first Smartphone and I’m actually on a plan with my brother. He has a little button that he can push that stops me from using data if I go over. Why? Because I honestly have no idea how much data things use, and I don’t want to end up going over! After all, going over means hidden fees! Well, maybe not hidden, I’m sure somewhere in the War and Peace epic contract, there is an itty-bitty passage outlining the punishments you can expect for viewing one too many emails! The point is, they’re confusing. With Straight Talk Wireless, though, the confusion goes out the window. Straight Talk Wireless, available at Walmart, takes the confusion out of getting a cell phone with a data plan. They offer unlimited talk and text plus up to 3GB of data for just $45 per month. No epic contracts that would make Chaucer cry, no weird rules that you only find out about later. What can you do with 3GB of data? Let’s take a look! 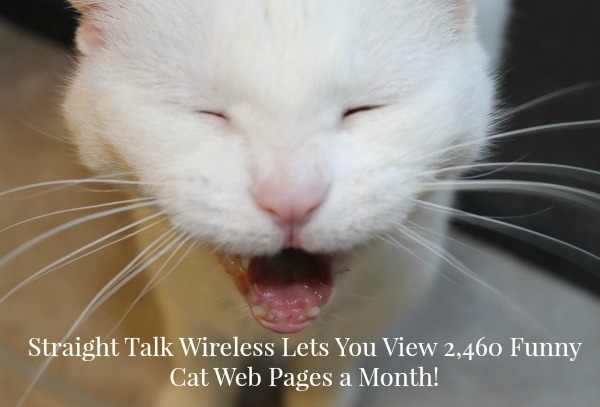 Check out 2,460 website pages about funny cats! Finally read those 41,900 emails sitting in your inbox and get rid of that little red number on your phone once and for all. Seriously, who thought THAT would be a good idea? I can’t take those little red numbers! Check out 1,920 images on Flickr of your adorable niece. Or mine! Argue politics for 153 hours on Facebook. Avoid driving aimlessly for 85 hours by using Google Maps. Remember, you can do any of those things, plus talk your best friend’s ear off AND text your spouse a million reminders to pick up milk for just $45 per month. If you don’t fall in love with Straight Talk Wireless, you’re not locked into a contract! It also has nationwide coverage on America’s largest and most dependable Networks. You can even keep your phone number if you want! Now that Jacob is starting after school activities, I’m seriously thinking of getting him a phone. I cannot believe I just said that! I swore no phone until he’s at least 13. At LEAST! But he just started chorus and I have this horrible fear that he’ll miss the activity bus, or decide he doesn’t feel good and comes home early. I don’t want him walking home in our development. It’s dangerous for many reasons. Plus, the child has more friends than I do and they all text MY phone! If I do cave, I’m definitely going with Straight Talk Wireless. Honestly, it’s the only plan that makes sense, especially for his needs. He can still use a smartphone if he wants, it will just save me a ton of money! What do you think? Have you used Straight Talk Wireless? How would this benefit your family? Thanks for laying out exactly what you can do on the phone. I know what 8gb etc mean but putting them into terms of exactly how much those numbers are of each thing is very helpful! WOW! That is a lot of Funny Cats. With that much data Lil Bub, Hamilton the Hipster Cat, Nala Cat, and Princess Monster Truck will have a lot more competition for top cat on the Internet. Seriously though I never realized just how much you can do with 3gb of data! Wow that sounds like an amazing deal. I’m paying more than that for less data. My husband needs more data as he uses it a lot at work.